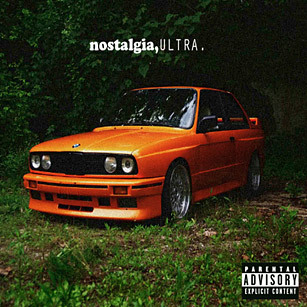 On Nostalgia, Ultra, which Frank Ocean made available for free on his Tumblr this year, the singer offers up bleak but appealing R&B tracks, many of which sample, remix or otherwise borrow from songs ranging from MGMT's "Electric Feel" to the Eagles' "Hotel California." Ocean also weaves audio of a tape recorder in rewind, video games and Nicole Kidman's adulterous monologue from Eyes Wide Shut into his songs to give the album a personal feel  as if Ocean were gifting us with a collection of sounds that he finds emotionally meaningful. Yes, he operates in depressive, downbeat moods, but his pop hooks and hip-hop-inspired beats help him do it in a way that doesn't feel self-pitying.